In 2002, the DiscoFish swam the Playa for the first time, creating many memories for the early innovators. 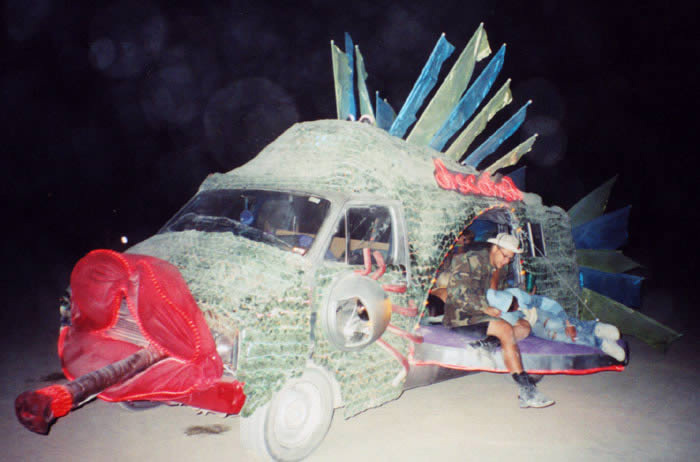 Like most mutant vehicles, DiscoFish was created for everyone as a gift to the Burning Man community. As long as there was room, people were welcome on board. But in order to enhance the experience for others, DiscoFish needed to evolve and grow. Empowered by radical self-expression and communal participation, DiscoFish continued to mutate. 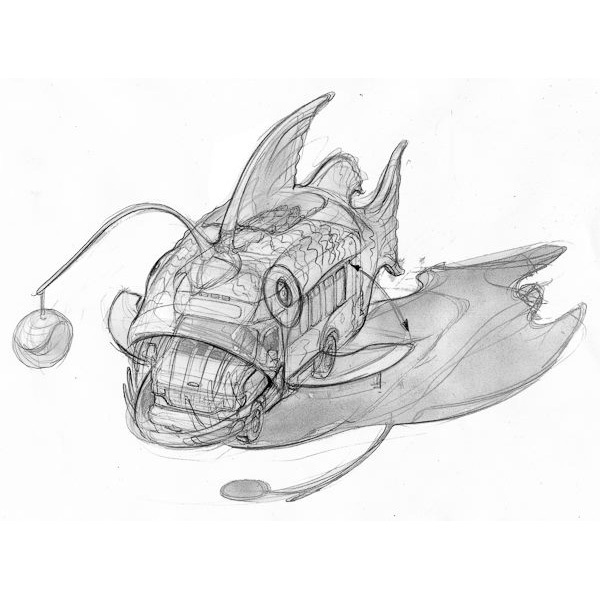 By 2011, DiscoFish had evolved into a giant anglerfish mutant vehicle with glowing iridescent scales, flamethrower, and a giant sparkling disco ball. Over the next 5 years the team adds adds the caboose, dorsal fins, etc. 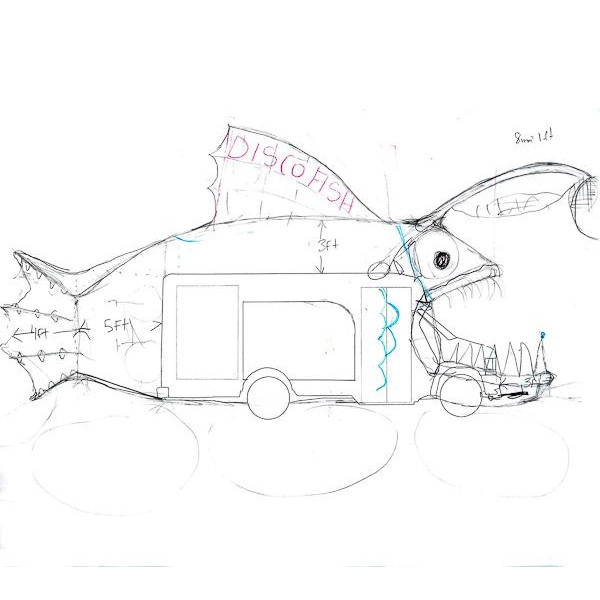 We even added laser radar to make the DiscoFish autonomous. For years DiscoFish swam the Playa changing lives and creating many memories. In 2017, she took her final voyage. Though we’re sad to let DiscoFish go, part of the experience of Burning Man is doing something better and different than before. This is why we build. We build to touch lives. We build to create stories worth telling. We build because we find joy in creating joy for others. Our vision is to build something even more ridiculous that has never been done before. Six fully-electric mutant vehicles will drive down city streets in single file then merge like Voltron to form the Techno Gecko on the Playa. Our mission with TechnoGecko is to empower others, to support diversity and art, to encourage love and passion, and to inspire innovation and self-expression. We have the tools, skills, confidence, and community to convert this vision, this dream, into reality. But it will require a lot of resources in order to pull together a mutant vehicle of this magnitude. It will take a lot of time, it will take a lot of commitment, and it will take a lot of money. Burning Man is about communal participation. Whether you’re participating in the build, donating money, or simply spreading our vision, we appreciate your support and welcome you to our community. Techno Gecko loves you, and we can’t wait to give you a dusty hug on the Playa.